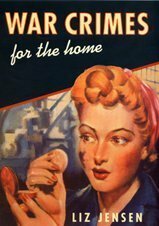 The writing style of War Crimes for the Home is very unique because not only is the dialogue written without quotation marks, but Liz Jensen incorporates both Cockney and lingo of the 1940s into the novel, creating a more authentic memoir-type reading experience. Although War Crimes for the Home is fairly short at 225 pages, I felt Liz Jensen went into a few uninteresting and lulling tangents that should have been avoided altogether. Given the book's length, I felt it would have been more impacting had Jensen added more tidbits focusing specifically on the plot. I am a fan of Liz Jensen's Egg Dancing , and still have a few of her other titles on standby. Although I found War Crimes for the Home to be unique, I also thought it easily forgettable.